Armored bulldozer takes on town. Forget the Batmobile...This is what battyman shud have!!! Crazy Man! Who said evil genius? omg this tank is sooo awesome!!! btw: why didn't they shoot him with a panzerfaust? 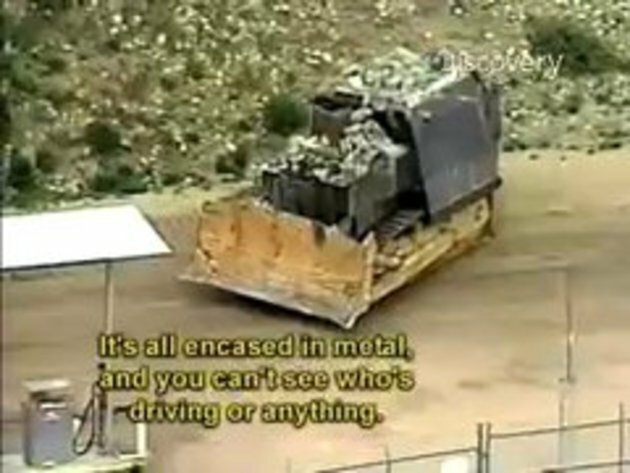 It's a Killdozer and its creator is http://en.wikipedia.org/wiki/Marvin_Heemeyer . I adore this man. "the vehicle's armor was over one foot thick, consisting of concrete sandwiched between sheets of steel to make ad-hoc composite armor. This made the machine impervious to small arms fire and resistant to explosives; three external explosions and over 200 rounds of firearm ammunition fired at the bulldozer had no effect on it." this was one of the coolest/scariest things I have ever seen in my life. That is one angry man. Wonder how long it took to build. 1 molotov coctail and thing is done. He got his revenge and nobody got hurt, except himself. I'd say mission accomplished. "God built me for this job", Heemeyer said in the first recording. Ah , he had an invisible friend he talked to . with those silly paper buildings. The guy in the bulldozer, crazy perhaps... but the police firing on the open street, what if a bullet went stray and killed some kid? Some people should not be allowed to wield a gun, period. wow, that guy had an incredible plan, too bad the engine went out. Maybe they should have fired paintballs at it to block camera sight? May seem cool, but I hate people who don't signal when lane changing. I love the way its reported as being out of control, it looks to me like its totaly in the control of the guy whos driving it. Awesome toy, where do i get one? #12 Hold on, i did some more googleing and found out that the actually requested an apache gunship helicopter to fire a hellfire missile at the dozer. Nice story. Where he went wrong was in sitting inside the dozer to drive it. He should have fitted the vehicle out with radio remote controls that he could operate from the safety of a secret hideaway, and then afterwards just vanish. i would love to have him in a zombie apocalypse!! or at least his machine!